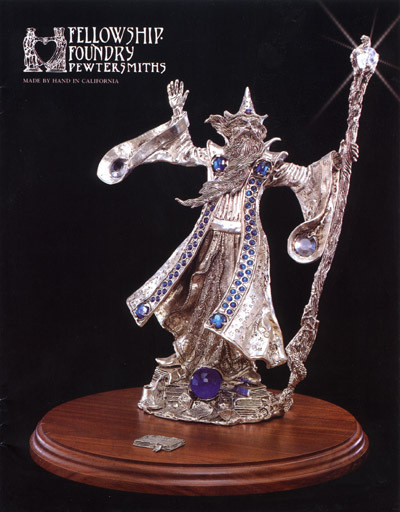 This wizard is a stunning example of the combined talents of our sculptor Kevin O'Hare and master pewtersmith Randal Moore. He stands on a pile of his spell-books with his sundial, mortar-and-pestle, and the rest of his tools scattered around him. His little dragon companion has wrapped itself around the wizard's staff. The Rainbow Wizard has Austrian crystals cast directly into the flowing pewter, echoing the forces of nature he commands. Each sculpture is signed by Kevin O'Hare, individually numbered, and mounted on a hardwood base. It is a limited edition from our Signature Series. Only 500 will ever be made.